Acrok provides the most practical video tips for solving all kinds of video format compatibility problems by using the world's most advanced video conversion technology. With Acrok Video Converter and Video Converter for Mac, users can easily convert all your videos to any popular formats and devices as Android/Windows/Apple smartphones, tablets, game cons, Smart TVs, HDTVs etc. Besides, some simple editing features are offered for users to enjoy editing videos by trimming, cropping, flipping, etc. Output videos supported by Apple, Microsoft, Samsung, Sony, LG, HTC, Asus, Dell, Acer, Sharp, Philips, Panasonic, Vizio etc., portable devices and TVs. Such as iPad Air, iPhone 5S, Surface 2/Pro 2, Samsnung Smart TV, Galay Tab Pro, Xperia Phones, Sony Bravia/Ultra TVs, HTC One, LG G Pad, LG Flex, Panasonic	Viera TVs etc. 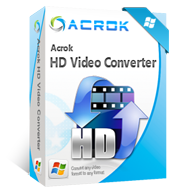 How to convert video via Acrok Video Converter? This page will show you how to convert any video format to any video format via Acrok Video Converter on Mac and Windows. How to convert MKV/AVI/WMV to MP4 on Mac and Windows? Want to get MP4 videos? 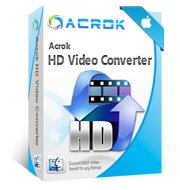 Acrok Video Converter is a best video converter for converting MKV, AVI, MOV, WMV, FLV, RMVB etc., video to MP4. Just follow this simple guide. How to load AVCHD/MTS videos into iTunes? Have captured a lot of AVCHD MTS files and want to import them to iTunes for management? If you wish to achieve your goal, you have to convert MTS or M2TS to iTunes compatible format. How to convert any video to Apple ProRes on Windows? With Acrok Windows ProRes Converter, you will can convert any video codec to ProRes codec on Windows via simple clicks. Looking for a simple way to convert MXF to H.264 on macOS Mojave? This article will offer you a best MXF to H.264 converter for macOS Mojave. Seeking a solid Handbrake alternative tool to convert H.265 videos on Windows and Mac? 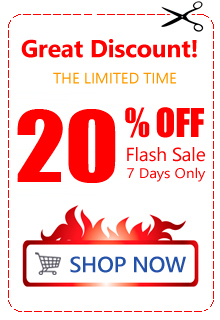 This article will offer you a best Handbrake Alternative to handle H.265 videos without trouble. How to play movies on Smart TV/HDTV via USB flash drive? Convert movies to TV supported video format via Acrok Video Converter. Let you play any format movie on Smart TV and HDTV via USB flash drive freely. How to convert and transfer movies to Android tablet? For watching downloaded movies on Android tablet, you need to convert your movies to Android friendly video format via a video converter. Acrok Video Converter is your best choice. Facing problems when playing H.265 files or edting H.265 files on macOS Mojave? Just get the best H.265 to H.264 Converter for Mac to achieve your goal smoothly. When I like something I always let people know, so here I am. Everyone looking for the good converter must try it once.